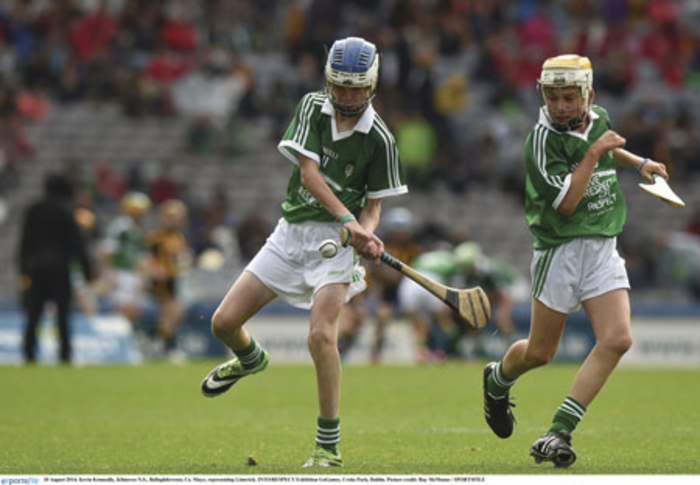 Kevin Kenneally, Kilmovee NS, Ballaghderreen, representing Limerick at the INTO/RESPECT Exhibition GoGames, Croke Park, Dublin. Picture: Ray McManus/Sportsfile. The Mayo u21 hurling team made the short journey to Athleague on Wednesday evening to play Roscommon in the Connacht u21B Hurling final. Mayo, under the guidance of manager Brian Finn, were hopeful of breaking the Rossie’s stronghold on the competition and were bolstered by an impressive win over Sligo in the semi-final last week. However their hopes were dashed as a very big and physical home team dominated for most of the game. Roscommon led by 2-7 to 0-1 after 20 minutes with Joe Henry and Tomas Fetherstone goaling for the home side. For the remaining 10 minutes of the half Mayo rallied with points from Morgan Lyons, Corey Scahill, and Ciaran Finn, and a well worked goal from Shane Boland to give the Mayo supporters some hope and leave the half-time score Mayo 1-5 Roscommon 2-8. The visitors needed a strong start to the second half but the match was all but over with quick fire goals from Robbie Fallon and Robbie Kelly to give Roscommon a commanding 4-9 to 1-5 lead with 20 minutes remaining. Mayo battled hard to put some respectability on the score line but despite the heroic efforts of midfielder Ciaran Finn, who nicked four second half points, Roscommon ran out deserving winners on a score line of Mayo 1-10, Roscommon 4-15. Mayo will be very disappointed with this result but in the cold light of day they will realise that they were simply out muscled by a more physical home side. Best for Mayo on the night were captain Tony Sweeney, Ciaran Finn, and Kevin Keena. Roscommon will now contest the u21B All-Ireland Hurling semi-final against Kerry on August 23. Mayo: Barry Lane, Declan Muldoon, Daniel Cunnane, Shane Healy, Nathan O’Malley, Tony Sweeney, Shane Nugent, Ciaran Finn (0-6, 4f ) Morgan Lyons (0-1 ), Corey Scahill (0-2 ), Kevin Keena, Matthew Flannery (0-1 ), Shane Boland (1-0 ), Patrick Kiely, and Sean Brogan. Subs used: Dominic Flannery, James Lyons, Art O’Suilleabhean, David Bell, Conor Murphy. Roscommon: Noel Fallon, Liam Kilcline, Darren Fallon, Warren Boyle, Conor Coyle (0-1 ), Cathal Dolan, Conor Fallon, Joe Brennan (0-1 ), Chris Duignan, Paul Kenny (0-1 ), Tomas Fetherstone (1-2 ), Hugh Rooney (0-2 ), Robbie Fallon (1-6, 4f ), Joe Henry (1-0 ), and Gearoid Keane. Subs used: Robbie Kelly (1-2 ), Graham Hendricks, Dermot Mullery, Peter Leahy. Referee: John Keane (Galway ).